Let us imagine for a moment that you have been away for six years or so. Perhaps you have been attempting to cross the Andes by frog, have been on a top-secret mission to Mars or have been finding yourself in an isolated Tibetan monastery. On your return to civilisation you might well be after a mobile phone to reconnect with the world. If this sounds like you, then the new Nokia 515 could well be the phone that you are looking for. This is a Series 40 feature phone rather than a smartphone. The only thing smart about the Nokia 515 is the way that it looks, and we must admit that this is a really good looking handset. 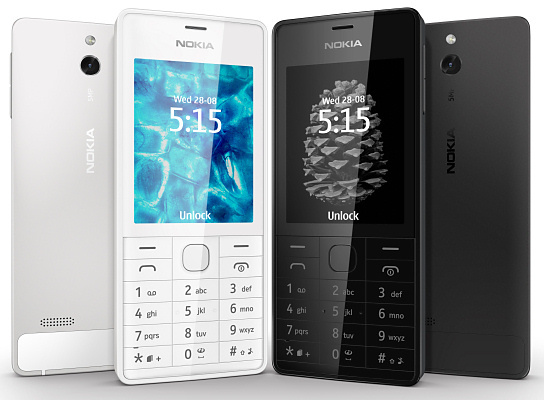 Available only in sober white or black colours with a thin aluminium body and coming in at just 11mm thick, the Nokia 515 has a touch of the iPhone 5 about it. Unusually for a device of this type, the screen has a smartphone-style Gorilla Glass 2 coating which enhances readability and provides some scratch resistance. The display itself is a modest 2.4" 240 x 320 pixel panel with a traditional (if rather flat looking) numeric keypad underneath. On the back of the phone is a 5 megapixel camera with LED flash which includes a voice guidance system for taking self-portraits and a modest video capture capability of 320 x 240 pixels at 30 fps. Inside is an FM radio with RDS, 256MB of flash storage plus a microSD slot, and the Nokia 515 can playback various audio and video formats, it has various social networking apps preloaded and it can sync directly with a Microsoft Exchange server which is handy for business users. This is a 3.5G capable device with HSDPA download speeds of up to 7.2Mbps, but given the phone's limited software capabilities and small screen size then it does seem a bit unnecessary. Nokia says that you can connect the 515 to a laptop with a USB cable and use it as a modem.. the sort of thing people had to do before WiFi tethering, and frankly it is a rather messy way of getting online. 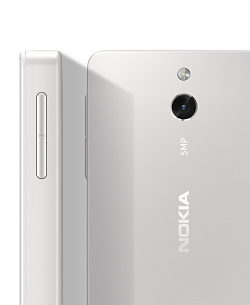 The Nokia 515 supports Bluetooth 3.0 and USB 2.0 connectivity as well. There are dual-SIM and single-SIM versions of the Nokia 515 available, both taking micro SIM cards (so you will need to ditch your old mini SIMs if upgrading). There is a relatively large 1200 mAh battery which gives 5 hours talktime on 3G and up to 38 days standby time on the single-SIM version or 24 days on the dual-SIM variant. Both versions weigh a shade over 100 grams and measure 114 x 48 x 11mm. Priced at €115 before tax and subsidy, the Nokia 515 isn't exactly cheap for a feature phone and is actually rubbing shoulders with some budget Android devices. But if you don't want all the features of a smartphone, but you do want something that looks elegant and has a long battery life then the Nokia 515 certainly looks like a good device to consider.